Elbows are close range striking tools. The IKMF Practitioner 1 curriculum includes three horizontal elbow strikes: Inward, sideways, backwards. Inward: This is a forward strike. Examples include defending against two-handed shirt grab(G2) and defending against gun threat from behind (see pic below). If you are striking with your right, bring your hand to your shoulder, bending the arm in a tight "V". You are usually striking the side of the attackers head/face. Your non-striking arm (in this case your left) should be vertical, hands up protecting your face and ribs. For maximum power, you are rotating your shoulder, back, hips and right foot. You are striking on a horizontal plane, making contact just below the tip of the elbow. (this concentrates your strike on a small surface). Keep your hands open! striking with the surface just above your elbow. your back. Escaping bear hugs from the back - arms free (P3) offers a clear example. Student performs backward elbows to escape rear bear hug. 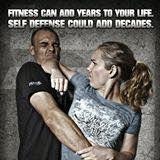 Elbows are very effective close range striking tools. Remember to keep you hands open, bend your arm into a tight V, rotate your body, and strike through the target.